Manufactured by the Sidebottom Novelty Co. of California, circa. 1946-56. It is unique for it’s “jukebox” style with curved glass top (yes, real glass), and for the 360-degree play field. 3.as a “Free Games” payoff game giving 20 free games on a meter each time a prize is won (the games can be played-off one-by-one with a button located under the coin entry, or an attendant can pay the player in cash for accumulated games and then clear the meter). 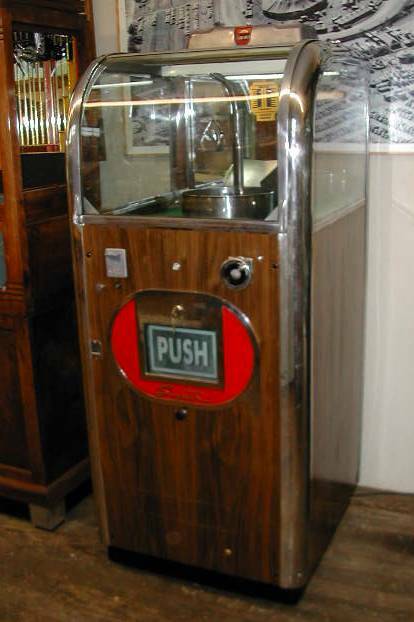 Students of coin machine history know that this game could not have been shipped legally in interstate commerce after 1951 due to Federal law: the Johnson Interstate Transportation Act of 1951. This pay-out digger was classified as a gambling device. This is possibly the best one of this make and model digger I know of today. I have restored it in my shop mechanically and cosmetically. (I did not re-plate the few plated parts as they have a fine patina.) I have had experience with 3 of this make of digger and this is the only one that has had genuine glass in the curved glass top. It also has very nice walnut wood veneer, original back mirror (with new decal), and a Bally 5-cent coin entry (basket style). The optional free-games attachment mounted on the cabinet top is the factory original. All of the mechanical and electrical systems work exactly as they should, and I have no doubt that this game could operate another 60 years in a commercial location.